A credit report evaluation is a good first step in your credit review process, allowing you to see if a new customer is worth the risk. It can certainly offer valuable information, but to take this review a step further, you’ll need to look at the company’s financial statement as well. You’ll get a more complete look at the risk you will be taking if you agree to do business with and extend credit to a new customer via the financial statement. When studying the financial statement, what should you look for? The three most important aspects of a financial statement include the income statement, balance sheet, and cash flow statement.1 The income statement, also known as the profit and loss statement, will detail company profitability over a given period of time; it breaks down the income coming into the company, which is a crucial part of the equation. The balance sheet will list the company’s “assets, liabilities, and owner’s equity”2 at any given time, preferably the time at which you are deciding whether or not to extend credit. Most credit reviews focus just on the first two, income and balance, but cash flow is equally important. This document will report, “the sources and uses of cash by operating activities, investing activities, financing activities, and certain supplemental information for the period specified in the heading of the statement.”3 Studying this information will give you a good idea of whether or not the business leaders will be able to meet their operating budget and repay the loaned credit based on how much money is coming in the door versus out. Rising debt-to-equity ratio — If the company decision-makers have more debt than they can handle, this ratio on the debt side would be over 100%. If that’s the case, it’s not wise to extend credit because they will not be able to meet financial responsibilities alone and will likely be unable to repay debtors. Downturn in revenue — If a potential new customer has had a downturn in revenue over the past several years, it’s likely this trend will continue. In this case, extending credit would be a risk. If their business has not been profitable as of late, leaders may not be able to repay due to lack of income. Inconsistent cash flow — If a potential customer does not have a fairly consistent cash flow, this could be a red flag because it may be hard for the accounting team to make credit payments if there isn’t a steady stream of income. The accountants may never know when they will have the resources to make payments. Any other outliers — If there are uncommon line items, reoccurring payments, increasing accounts receivable markers, or anything else unusual on the income statement, do some research to determine what these may be. They could be the results of a bad credit management process or signs of a manufactured income statement — and it would be a risky move to consider lending credit in either case. Studying potential business partners’ financial statements is a productive way to determine the risk of lending credit, which will ultimately help protect your business. If this process seems like a lot of digging, the help of a professional credit management partner can help you make the process part of your regular routine more manageable. Once you’ve incorporated financial statements into your risk management process, you’ll be glad you did. 1 Averkamp, Harold. 2016. “Income Statement (Explanation).” Accounting Coach. Accessed August 9. http://www.accountingcoach.com/income-statement/explanation/1. 2 Averkamp, Harold. 2016. “Dictionary: balance sheet.” Accounting Coach. Accessed August 9. http://www.accountingcoach.com/terms/B/balance-sheet. 3 Averkamp, Harold. 2016. “Dictionary: statement of cash flows.” Accounting Coach. Accessed August 9. http://www.accountingcoach.com/terms/S/statement-of-cash-flows. 4 Sullivan, Megan. 2016. “8 Red Flags You Can Spot on Your Financial Statements.” Intuit. 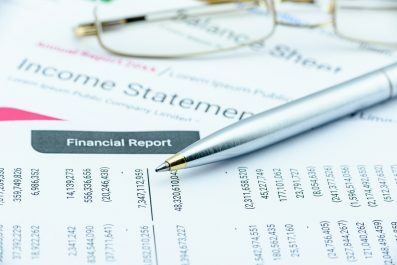 http://quickbooks.intuit.com/r/bookkeeping/8-red-flags-you-can-spot-on-your-financial-statements/. This entry was posted on Tuesday, August 16th, 2016 at 2:35 pm	and is filed under Risk Management. You can follow any responses to this entry through the RSS 2.0 feed. Both comments and pings are currently closed.